I too have the firefly and used it with Win10, but i can't remember if i really installed the snapstream basic drivers or windows just installed x10 drivers that also worked. Just now plugged the receiver. No driver were installed by windows. Via device manager i let windows search online, a driver were downloaded + installed. But the X10-plugin in EG could not find a driver. Then i run the setup i've attached above (firefly_drvs.zip). During setup i've got an error, but it seems something were installed because now the plugin in EG could be started without error and i get events when pressing buttons on my remote. I believe what was taking place is the same issue we have been having with the driver signing. except this kind of worked in your favor.. The installation of the "windows drivers" put all of the registry bits in place and install the drivers.. but there is something wrong with the actual files. the generic ones you may be getting the error because of driver signing. but because all of the registry bits are in place the generic files are without error and have been put into place. This is the only scenario which i could come up with as to why it is working. whatever the reason is it's good to have it now documented. Ok guys, so do you think I should attempt a win10 install again on my mac to see if it will now work with the "old" firefly drivers Topic has uploaded? I would download virtual box and install it on that and run it on your mac. see if it goes well that way. Thx, yes that should be a better option so I would not need to have to reinstall OSX to use Bootcamp.tomorrow I will looking into using VB for this experiment. I know you were looking into parallels I would check with them and see what VM Disks they are able to load off of. This way if everything works as advertised then you can keep using that Windows 10 installation and simply have parallels load it. Thx for that link, will refer back to it after this experiment is done. I am trying the free trial of Parallels so I have 13 days to complete this experiment. OK you are at the point with the divers this is where topix is going to be of more help. since he is the one that got them running. you can attach pictures directly to a forum post. drag and drop when writing the post. and then place them inline. it looks like you took that image with a cell phone. I am not sure if you have these buttons on a mac keyboard. but... print screen (prtscr, prntscr) will capture the current whole screen to clipboard. use paint to paste it down then save it. drag and drop the file onto a post. That's the error i've got and mentioned in my previous post. Oh wait, i think I had misunderstood. 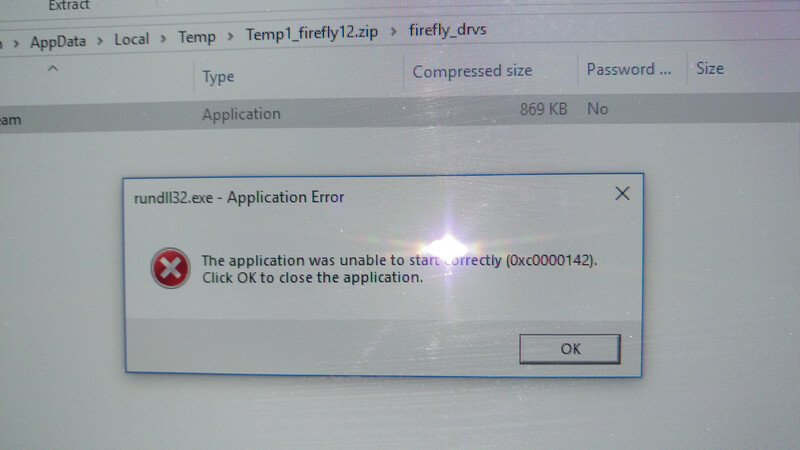 I had thought you were able to use the firefly driver with win10.